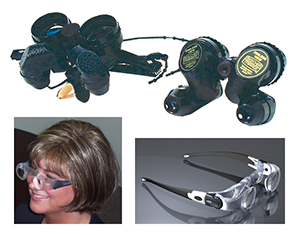 Devices for Near Tasks - A resource for people with a vision impairment due to macular degeneration, diabetic retinopathy, glaucoma and other eye conditions. Hand-held magnifiers: Hand-held magnifiers are designed for short-term near-vision tasks such as reading menus, price tags and pill bottles. These helpful devices are very portable, versatile and economical. These devices are available in illuminated and non-illuminated options for better control and ease of use. A low vision specialist can customize the combination of magnifiers and eyeglasses to provide the best possible results. It is important to note that the stronger the magnification, the smaller the viewing area. This makes the intended use of the product very important to making the right purchasing decision. 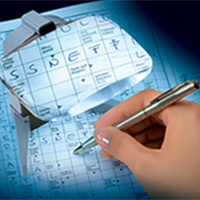 Stand Magnifiers: Stand magnifiers are magnifiers placed on top of an object to be viewed. They are perfect for extended periods of use, including reading and writing or even sewing and crafts. Stand magnifiers are available in non-illuminated and illuminated versions. 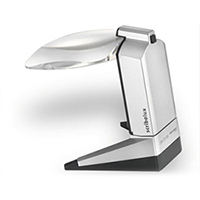 Illuminated stand magnifiers provide additional light to the object being magnified, helping to reduce eye strain and fatigue. These magnifiers are often portable and lightweight. 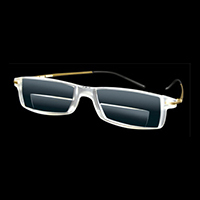 Specialty eyeglasses or magnifying spectacles are a common type of head-worn magnifiers available for people with low vision. There are magnifying spectacles available that can improve vision regardless of whether the desired field of vision is near or far away. Additionally, optical technology continues to advance, allowing lenses to be thinner and more comfortable, therefore making them a less obtrusive vision care option. 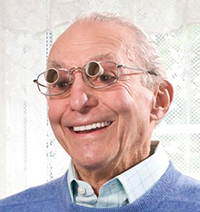 Magnifying spectacles for low vision patients can be made to use as bifocals or purely as high-level magnifiers. 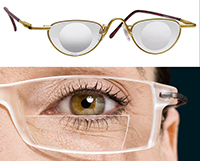 They also are available with a number of treatments and options to help with glare control, including anti-reflective coating and photochromic treatments. 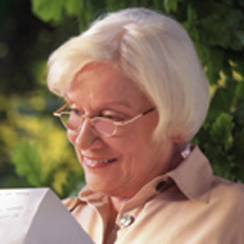 Video Magnifiers: Standard video magnifiers offer the benefits of distance and close-up viewing. They are electronic devices, and typically consist of a camera and viewing screen to aid people in tasks including reading, writing, grooming or even cooking. Material placed under the camera is magnified and displayed on the video magnifier’s monitor. 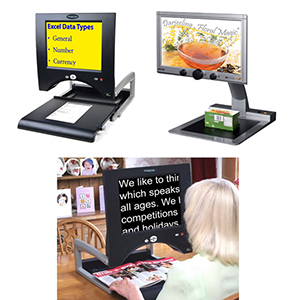 Video magnifiers exist as desktop units, which use a closed circuit television for viewing, as well as portable or hand-held video magnifiers for use on the go or during short tasks. Microscopes and Microscopic Spectacles: In cases where wearers need very high levels of magnification at extremely close distances, microscopes or microscopic spectacles are the best choice. Microscopes allow people to see smaller details but are intended for short periods of use. Spectacles have also been developed as both single vision microscopes and bifocal microscopes, with the rear of the lens incorporating a regular prescription and the microscopic lens attached to create a doublet microscope. Telescopic solutions: Telescopes can be hand-held or mounted into a pair of eyeglasses and designed for monocular or binocular use, meaning they can be used over one eye or both eyes. They are best used when stationary such as when working on crafts, at the computer or while reading.